The following entities are great examples of collaboration between our health providers and the researchers and academics at the University of Auckland. 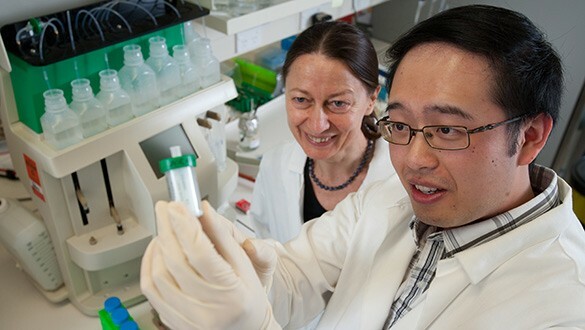 The Auckland Bone and Joint Research Group is a world-leading research partnership which has pioneered major medical breakthroughs in the treatment of osteoporosis, Paget’s disease and gout. The importance of this group will continue to increase as Auckland’s population ages and becomes more susceptible to the bone and joint problems that negatively impact the quality of life. Understanding the brain is the last frontier of medical research and one of the most challenging areas in all of medicine. By unlocking the secrets of the brain, we learn more about ourselves and our future. The Centre for Brain Research (CBR) has built an international reputation for innovation, collaboration and world-class research in neuroscience. Magnetic Resonance Imaging (MRI) is the method of choice for the diagnosis of many types of injuries and conditions. The Centre for Advanced Magnetic Resonance Imaging (CAMRI) at The University of Auckland continues to push the technology to make it do more. CAMRI is the first MRI venture in New Zealand to focus on high-end research work as well as routine clinical imaging. The Centre leads the world in the evaluation of heart disease and has a research collaboration with Siemens Medical Systems. As part of the Auckland Academic Health Alliance’s (AAHA) commitment to advancing research, this website will be updated with information about relevant research studies. A problem bedevilling research in epilepsy is that the condition is very diverse and often of unknown cause. Using conventional means, it is difficult to organise the required number of study sites and sample size of patients with a particular condition. Dr Peter Bergin’s web-based EpiNet platform is allowing epilepsy specialists to enrol eligible patients from virtually anywhere in the world. In the 1980s, the entire Bay of Plenty town of Kawerau was screened for hepatitis B. Five hundred carriers were identified and 1,100 controls for the carriers. Professor Ed Gane, from the School of Medicine and the New Zealand Liver Transplant Unit, received a Health Research Council grant in 2010 to assess long-term outcomes of the carriers vs controls. The University of Auckland is part of a major collaborative project designed to better understand the burden of influenza and how it is spread globally. The five-year project is jointly funded by the US Centres for Disease Control and by the Institute of Environmental Science and Research (ESR).